Google Quality Score update has started to take effect on my accounts. In a previous post I covered the upcoming Google Quality Score changes. It seems last few days the change started to show on my accounts, and the outcome is quite interesting. Google is now sharing with us a real rank – score of 0 to 10 out of 10 possible points, and when our score is low they recommend us the necessary changes in order to improve our quality score! 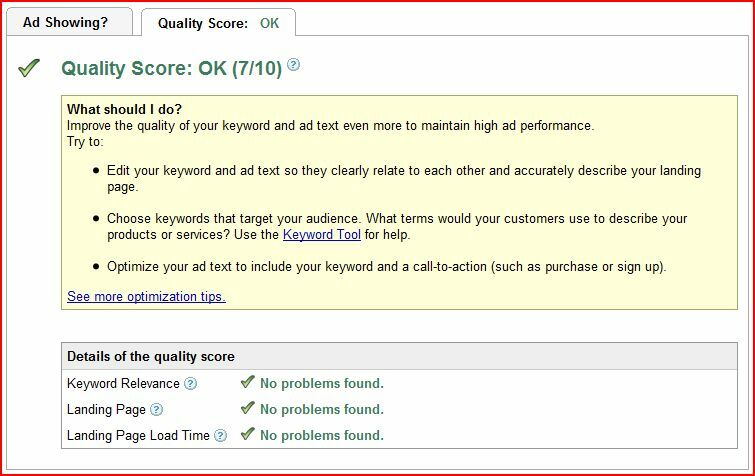 For more info See google quality score update, August 26th 2008. and on the AdWords Blog from August 21st 2008. For the last few days, I am starting to see the effect of the change, which is up until now mainly visual. It seems Google quality score now actually has a score! Up until now, the score was either Poor, OK or Great – last few days, my quality score shows a rank out of 10 i.e. 2/10 (for poor) or 9/10 for great – ain’t that so cool? Well, apart from the fact it looks very self explanatory, they added tips and guidelines which are changing based on the score, and based on the different keyword / bid /ad / landing page combination. This is IMO a very important step for better transparency Google now offers advertisers. This example (from a live campaign) is from a high performing keyword. I added the numbers to show the clear correlation between the performance of the keyword and its quality score. In this examples we see the difference between 5/10 and 7/10, where Google decides to add or not to add their comment to my keyword. 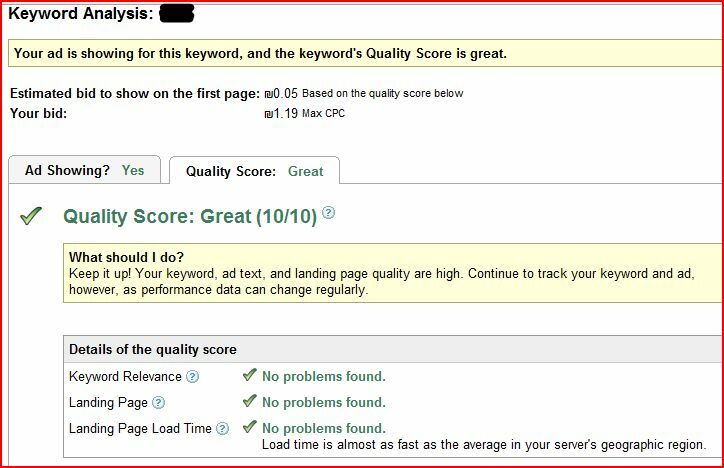 Pure and simple – poor performance, poor keyword and Google says – Dude, you are better off without this word! It’s not showing ads, it does not convert and the user experience is not good enough. In other words – either optimize your campaign or delete this word. We’ll keep following the changes and updating on new features and implications f this new system. I’m sure there’s more to it than this though. Congratulations on your 10 Quality Score. I have only found 9s so far. With a 44& CTR, I am curious is your keyword a “Brand” related term? 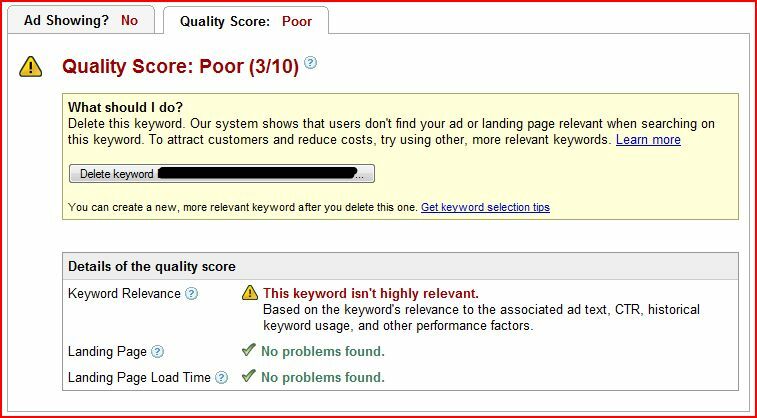 I have also seen ads and keywords with Poor quality scores as low as 4 still displayed. I am having a tough time understanding why some of the keywords that I am ranked very well for in Organic are giving me such a tough time with adwords?? Same landing page, load times are good??? I’ve been having problems for over two months cancelling the Google adwords service. I finally cancelled it successfully last month with a zero balance. This month I got another deduction from my credit card. There is no telephone support and I get only stock answers to me email questions that tell me how to cancel my account (which was already cancelled). Congratulations on your 10 Quality Score. I have much to learn. Thanks for the article.